Written for kids 8-12, Believe: Kid’s Edition is part of the national church-wide campaign led by bestselling author Randy Frazee that takes kids on a journey to become more like Jesus in their beliefs, actions, and character. They know the story of the Bible, but do they know what it means? Adapted from the ground-breaking new Believe campaign from bestselling author and pastor Randy Frazee, the Believe: Kids’ Edition takes kids on a thematic tour through the Bible and shows them how to think, act, and be more like Jesus. As children ages 8-12 walk through the three big categories of Christian life—beliefs, practices, and virtues—they’ll begin a journey that will take them closer to the heart of Jesus and deeper into the words of Scripture. They’ll learn what the Bible has to say about everything from the nature of God and the identity of Jesus, to prayer, worship, and the fruit of the Spirit. Foundational and faith-building, this book can be used by individuals or in conjunction with the all-church campaign. 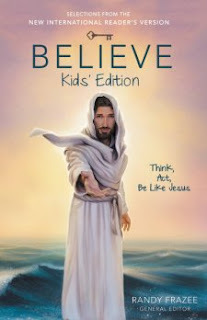 Believe Kids' Edition Think, Act, Be Like Jesus is a great book for children 8 to 12 years of age and up. I love this book because it teaches kids to have good morals and values. Believe Kids' Edition Think, Act, Be Like Jesus is broken down into chapters and teaches children how to be more like Jesus. At the beginning of each chapter the book asks a question, then children read scripture and the chapter ends with a discussion questions. I also love that this book takes scriptures and explains them to children in a way that's easy to understand. This is a wonderful devotional for children! You can find Believe Kids' Edition Think, Act, Be Like Jesus By Edited by Randy Frazee on Amazon, Barnes and Noble and other bookstores.